I know some will play this and I'll never hear a word from them, I accept that. Some might even rip the method AND still play it. lol This is flat betting. I use units of $15, $10 and $5 but use whatever fits your budget the best. I try and separate fact from opinion. A fact is, in 'X' number of spins, we will get a complete street hit, all 3 numbers. I do have to thank Bayes ahead of time, he helped me a bit. Ok, on to the method >> I keep track of the last *12* numbers hit. When the next number hits, cross off the latest number, we will always be looking at the LAST 12. Any street with TWO of the numbers hit, is what we are looking for. Example: the 14 and 15 are hit within the 12 recorded. We flat bet the 13 UNTIL either a win OR until either the 14 or 15 is NOT within the 12 recorded anymore. I have done lots of testing recording the last 11, 10, 13 and 14 spins, I have found that *12* works the best. Anytime all 3 (a win) are within the 12, no more betting on that number UNTIL it drops back to two within the street. EXAMPLE: We were betting on the 13, it hits and we have a win. Lets say a couple spins later, the 14 drops from the last 12 recorded. We NOW have the 13 and 15 hit so we bet on the 14 until either a win OR until either the 13 or 15 is NOT within 12 recorded anymore. Don't make this tougher than it is. Sometimes I over explain stuff. lol Now, what about multiple bets going on? This is what I do in terms of betting. 1-2 bets: I bet $15 per number, 3 bets: I bet $10 per number, 4+ bets: I bet $5 per number. It is very rare to have 4+ within 12 but you MUST have a RULE for every situation. Thanks for sharing Mr J! A fact is, in 'X' number of spins, we will get a complete street hit, all 3 numbers. Here I must agree and my quick test shows that number is expected to be no more than 255 spins. Its VERY common for a street to hit within a short (12) period of time. Here I must disagree. I do not find this common at all. I think where the issue gets confused is that multiple bets are being placed which will bring results based on the increased numbers being bet. And the results come back with 199 spins. 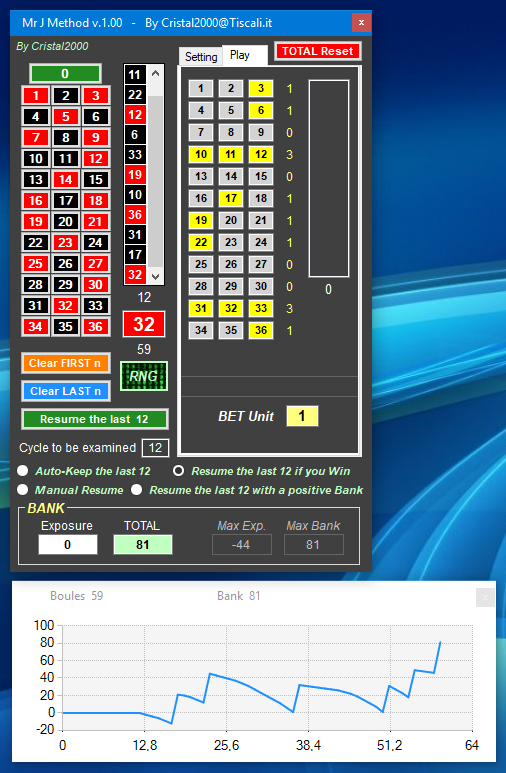 I think a possible solution is to abandon the constraints of the street bet and work with 3 numbers straight up. The minimum appearance for any 3 numbers is once in once in 184 spins; i.e. any one of a group of three numbers will be expected to hit at least once within 184 spins. I'll even pick on myself and make a point at the same time. I think this was in 2010. I'm not EVEN CLOSE today in terms of methods or ideas like this. Why? You have to *LEARN* over the years. Most here REFUSE to do so. EVOLVE, advance your thinking !!!! In reality RNG spins results and real roulette wheel spins results cannot be compared. Random number generator is really random while real wheel is not so full 100% random so they both dont act same way. So many times many peoles try prove RNG numbers live wheel playing methods wrong. I think both RNG and physical wheel results model each other and there can be cheating on either side but it is certainly true that only physical wheels can have exploitable physical biases. I believe we can win playing either as long as the results are fair. "we are also waiting for Mr. J. if he has any changes" >> In 8 years? Ummmm, yeah.